This page requires a modern browser (HTML5/CSS3 flex). Your experience below may be suboptimal. Contact info@euclidmeasuring.com if you have questions. 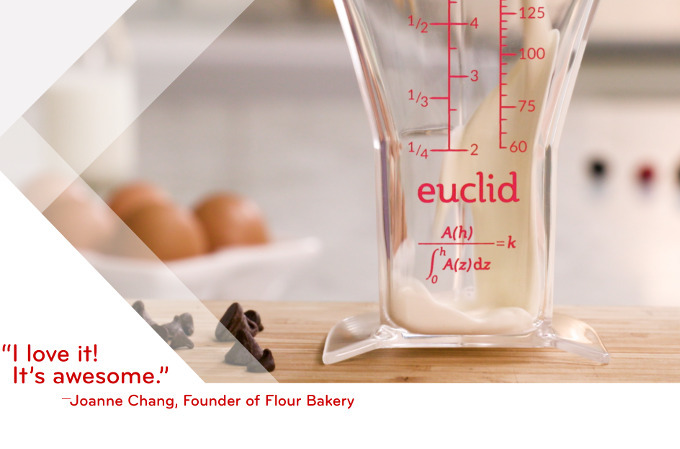 Euclid’s patented, mathematically optimal shape makes for better measuring – and that means better results for every recipe. Credit to apply $ . Your payment card information is on file until your card is charged and your order ships. Your pre-order total has increased. Please re-enter payment information to confirm. ?3-digit security code often found on the back of your card. American Express cards have a 4-digit code on the front. Ignore USPS errors - Be sure to enter a deliverable shipping address if you choose to ignore USPS validation errors. Your card will not be charged until Euclid is about to ship. The shipping carrier may require payment of VAT or import taxes. Orders placed before 1230pm ET typically ship same business day. 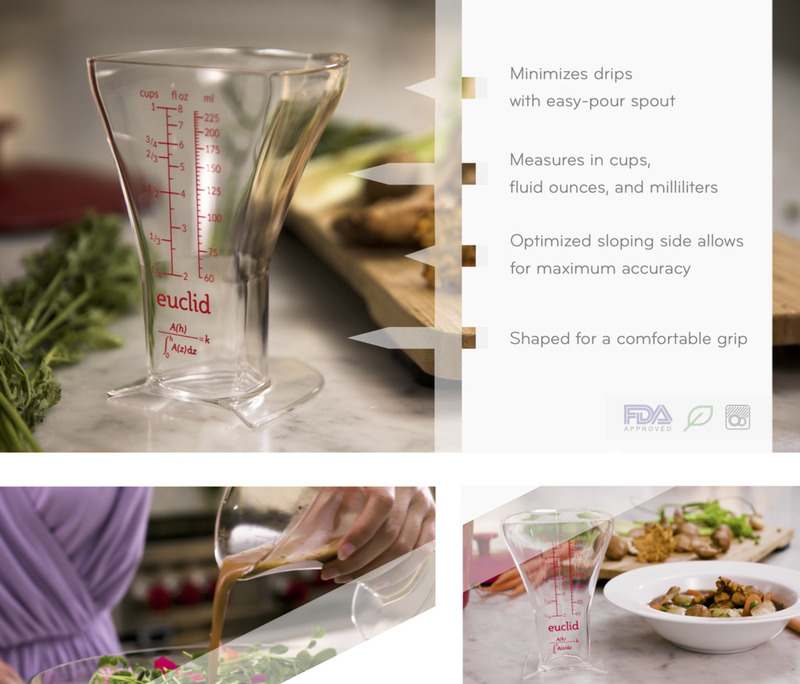 We’re tech nerds with a passion for cooking, and we've created a better measuring cup. 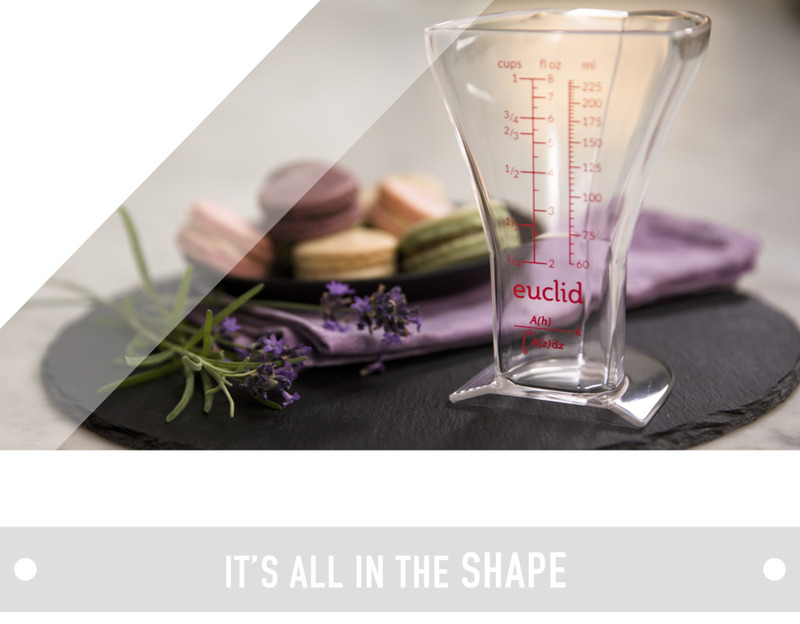 Euclid’s patented shape delivers a level of accuracy that no traditional measuring cup can match. 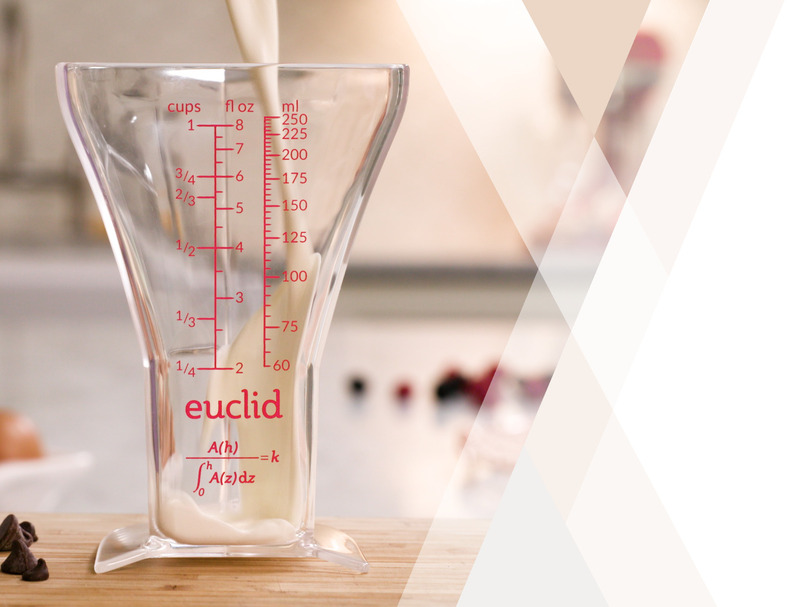 Euclid is the first measuring cup to measure small amounts and large amounts with equal accuracy. Since recipes are all about ratios, that consistent accuracy across different amounts is essential. Consistency also improves repeatability - key to refining recipes over time. With traditional measuring cups, the smaller the amount, the harder it is to measure accurately. The culprit? The shape. Straight sides magnify errors when measuring lower down in the cup. Some have tried to solve this problem with conical measuring cups, but their results fall short of Euclid’s by up to 60%. 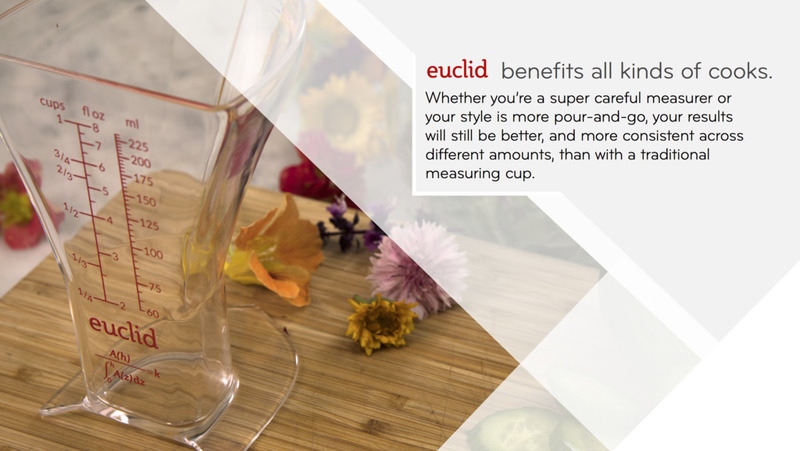 Euclid is the only measuring cup with a mathematically optimal, tapered design for consistent accuracy across amounts. 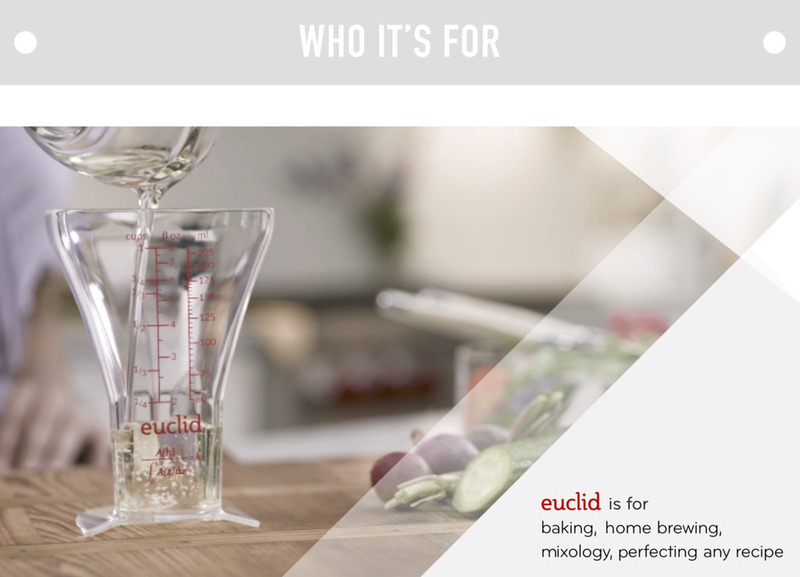 Euclid is great for makers of all kinds: bakers, home brewers, mixologists and anyone else who wants better results in the kitchen. And of course, it’s for those who appreciate math and smart design. Euclid is shaped so that for every measurement amount, the ratio of surface area to volume is the same. Here's how this improves accuracy: When you're measuring, it can be tricky to get the liquid to the correct height in the cup. That's because it's easy to misread the level slightly (for example, due to liquid sloshing or the measuring cup being tilted or below eye level). The result is that while it might look like you've measured the right amount, you've actually overshot (or undershot) the intended measurement line by a little bit. Let's suppose you overshot by 1 mm. The measuring cup will then contain a thin layer of extra liquid. Its volume is 1 mm × the surface area. Your measurement error is the ratio of this extra volume to the desired volume. Euclid's shape preserves the ratio of surface area to volume as you measure more or less and so the ratio of extra volume to desired volume also does not change. This is why Euclid is just as accurate measuring small amounts as large amounts. Contrast that with a traditional measuring cup, where its surface area to volume ratio increases as the measurements get smaller. So, an extra 1 mm of liquid yields three to four times the error (depending on the shape of the cup) at the 1/4-cup mark than at the 1-cup mark. Conical measuring cups out there try to solve this problem, but a cone’s sides do not narrow quickly enough to do the trick. For example, a 1-cup-capacity cone with the same surface area as Euclid at the 1-cup line will be 60% less accurate when measuring at the 1/4-cup line. Euclid is dishwasher safe and made from BPA-free and FDA-approved Tritan plastic. Its dimensions are 3.8”L X 4.2”W X 5.3”H, with a 250-ml capacity (slightly larger than 1 cup). 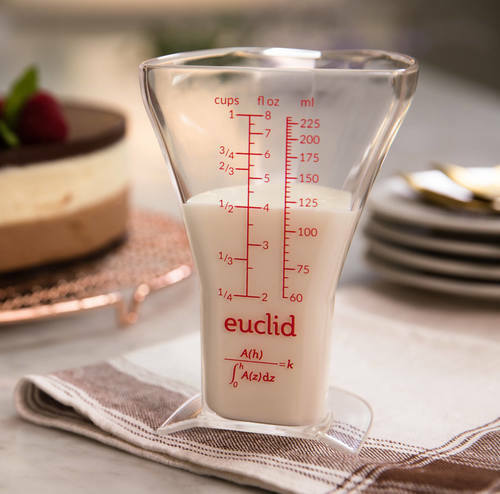 The inspiration for Euclid came about in the kitchen, when creator Joshua Redstone was working on a recipe that called for 1/4 cup of milk. He had a choice between a smaller or larger measuring cup and asked himself Which one would measure more accurately? He realized that there was a mathematical way of framing the problem, and as a math nerd he couldn't resist finding the answer. The first step was solving the math, that is finding shapes that preserve the ratio of surface area to volume. There were many possibilities. Josh created a software plugin for SolidWorks (a commercial CAD package) to make it easier to explore them. An example of an interesting early challenge is that industrial printing technology cannot print line markings accurately on a surface that curves in both the horizontal and vertical directions, due to Gauss's Theorema Egregium. This meant that a circular shape was not possible, instead needing a shape with a large, flat surface, which also makes the markings easier to read. After many iterations and prototypes, we finally arrived at a design that is elegant and satisfies the real-world constraints of manufacturing and labeling. Euclid is named after Euclid of Alexandria, who is considered the founding father of geometry. The equation printed on Euclid captures its mathematical essence: a constant ratio of surface area to volume. We’ve been granted US Utility Patent 9341508, which extends to any device that measures volume, including laboratory equipment, bar jiggers, and rain gauges. He received his PhD in Computer Science at University of Washington before working at Google and Facebook as a software engineer. He now lives and works in Cambridge, MA, where he innovates kitchen products and probably bakes too much cornbread. Many others contributed to this project, including a number of generous friends who shared their expertise in cooking, visual and industrial design, manufacturing, and marketing. Audio / visual: WBUR-NPR (Bostonomix), WCVB-5 ABC (Chronicle) and NBC-10 Boston (Hub Cooking Club). As well as American Mathematical Society, bltd, CookingLight, Boston Business Journal, Laughing Squid, did you know?, BostInno, The Gadgeteer, Digital Trends, VentureFizz, Home World Business, Gourmet Insider, Gear & Grit, The Upscout, My Modern Met, Gineers Now, Livestly, Mashable and others. Copyright © 2019 by Equatine Labs. All Rights Reserved. Privacy and Terms of Service.